The cost of a 1,200 MW HVDC electric submarine cable between Iceland and the United Kingdom (UK) is likely to be GBP 1.58-1.68 billion (USD 2.63-2.80 billion). This includes the cable (with a capacity of 1,200 MW), converters, cable mobilization, and installation. 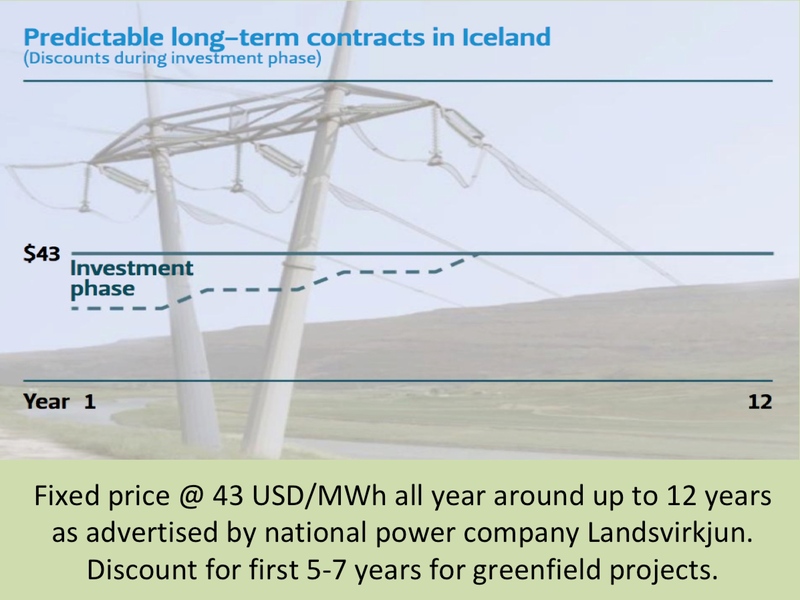 These cost-figures are presented in a research paper from 2010; Proposed Iceland / UK (Peterhead) 1.2 GW HVDC Cable. The authors are three engineers; Thomas J. Hammons from University of Glasgow in Scotland, Egill Benedikt Hreinsson from University of Iceland, and Piotr Kacejko from Lublin University of Technology in Poland. According to the paper, there should be no major difficulties in the manufacture and laying of submarine cables of length and type necessary for the IceLink connector. What is no less interesting is the finding that the cost of delivered energy would be very competitive with offshore and onshore wind, and of new coal/gas and nuclear plant. Also, the connection would offer high reliability; at least equal to that of new coal/gas and nuclear plant in the UK. Cost of electricity delivered would be very competitive with that from new wind-farms, nuclear, modern gas/coal fired plant, and tidal barrage / tidal stream power. Availability of the connection should at least equal that from nuclear, and gas/coal fired plant. No major difficulties are anticipated in manufacturing, laying and repairing the submarine cables or in construction of hydro schemes for the Link. Expected life for hydro developments is at least 60 years, submarine cables 50 years, and rectifier/inverter stations 30-40 years. The link could be considerably expanded in future to utilize deep-well geothermal power when the technology is proven. The contribution would make a significant contribution towards UK and European targets for renewable energy. The development would benefit the Icelandic economy, rather than demanding huge amounts out of a heavily damaged economy without supporting necessary recovery. The Icelandic hydroelectric system is likely to be a perfect match for interacting with the UK/North sea wind energy resources in a similar way as the Norwegian hydroelectric power system. 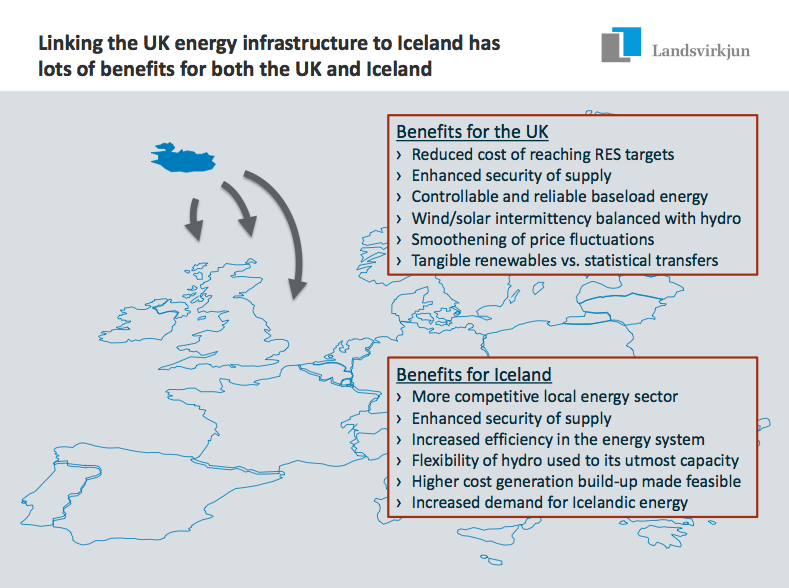 The HVOC UK-Iceland link can serve partly as a one­ way exporter of hydroelectric or geothermal energy from Iceland to the UK or it can be considered as a short term bilateral medium for hourly interaction of hydro with marketslwind based on market signals or short term shadow prices. This dual role should be further defined in a negotiation process between the respective national authorities. The study can be downloaded here (pdf) from the website of University of Iceland.